We often read in the Gospel about how different people turned to the Lord Jesus with a request, question, demand, or even a rebuke or reproach. Here is the unfortunate father of the sick child, saying with tears in his voice, with both hope and doubt: “I believe, Lord. Help my unbelief!” Here is the Roman centurion who is asking the Lord to heal his servant; this officer has no doubts. He says: “Just as I give orders to my soldiers, so do You have the authority to give the order and the sickness will leave my beloved servant.” Another approaches Him and asks: “What do I need to do to attain eternal life?” A third comes to thank the Lord for a healing He had performed. When reading the Holy Gospel, each one of us can easily recognize himself in one of these people, since we continue to turn to the Lord in just the same way. It is no accident that today we heard these words of the Apostle: “Jesus Christ is the same yesterday, today, and forever.” The same! It is as if He were here with us, as if He were standing right here. We can turn to Him, each with his own needs, his own thoughts, his own suffering of heart, and his own joy and gratitude. Each such movement of soul is a kind of prayer addressed to the Lord. But in today’s Gospel reading we heard an appeal that is extraordinary, strange, and seemingly inexplicable: the Gadarenes ask Him to go away from them, to leave, to depart from their coasts. Why did they ask Him to leave? Let us recall what happened. A violent wind arose over the sea, carrying the boat in which the Lord and His disciples were sailing to the barren western shore inhabited by the pagan Gadarenes. As soon as the Lord stepped onto the shore, two half-naked men – ragged, frightful, wild, and feared by all in the region – ran out to meet Him. They lived in desert caves where the dead were laid; people avoided these places out of fear of these possessed men. People tried to bind them, but they tore through all ropes and chains. These two possessed and afflicted men rushed out to meet Christ, frantically crying out: “Leave us alone! What have we to do with You, Jesus of Nazareth? 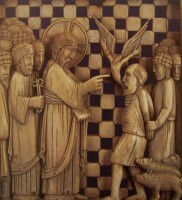 Have You come here to torment us before the time?” Before the time… It seems that the dark forces of paganism knew that they would be defeated; it is as if they were occupying these people and saying to the Lord: “You have come before the time to torment and destroy us.” The Lord cured these two demoniacs. But the swineherds who grazed their swine on the sea bank saw everything and went running into the city to tell the people. Then, as the Evangelist relates, the whole city poured out to see the miracle. And what did they see? They saw the sick, mad, afflicted men sitting calmly at the Teacher’s feet. And what did the people do? Instead of praising God or thanking the miraculous Healer, they asked Him to leave their region. They were frightened and did not want to listen to His words; this miracle shocked and terrified them. As Blessed Augustine himself relates, before his conversion to God he prayed: “Lord, save me and deliver me from sin – only not now. For now let me stay like this.” Many of us reason the same way. We do not want the Lord to bother us. Even when we enter the Church and do everything required of us, we do not want to lift a finger to live a truly Christian life or to perform deeds that correspond to Christ’s will. It is easier for us to push it away from us, to brush it aside, to turn our back on it. We do not explicitly say: “Leave us alone,” but we act as if we wanted to get rid of this power, this will of the Lord, that seems to press upon us. But in fact the Lord does not push or lay a heavy burden on anyone. He simply says: “Here is the path of life: follow this path and you will find happiness greater than any on earth.” But we – through our stagnation, coldness, negligence, and laziness of soul – are often incapable of hearing this voice and of making use of the path to the Heavenly Kingdom that has been shown to us. 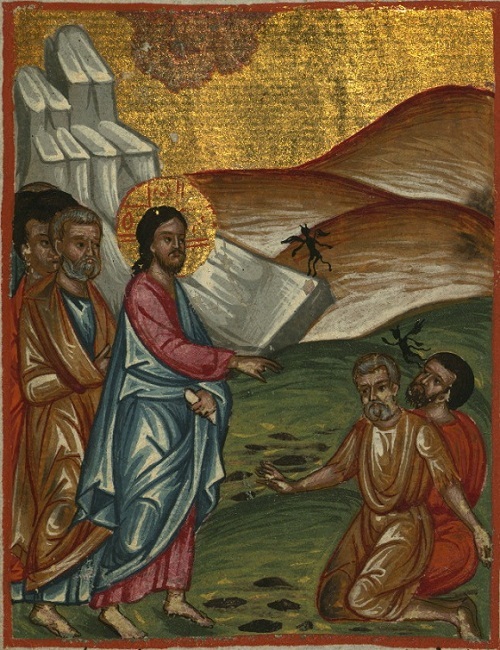 You see, the words of people who turned to the Lord can teach us a great deal: some encourage faith in us: “Lord, help my unbelief!”; others teach us how to give thanks; some will help us question the Lord about the mysteries of life and the right way; and finally, words like those of the Gadarenes will warn us not to miss the right moment, our time, when the Lord sends His gift to us, but rather to accept it wholeheartedly and respond to it with our entire lives.